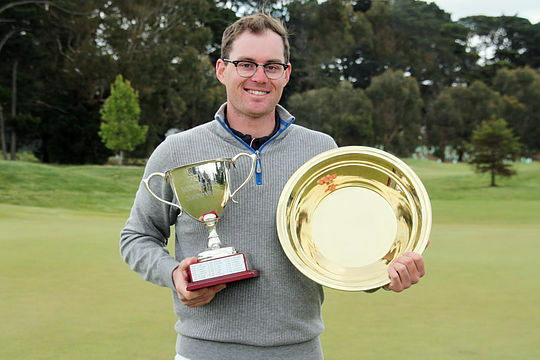 PGA Trainee Ben Stowe from Royal Sydney Golf Club will finish the third year of his PGA Traineeship on a high note after winning the $60,000 National Futures Championship at Ballarat Golf Club. After setting the course record at 7-under 65 in round three, Stowe’s final round of even par was enough to see him record a five-shot victory finishing at 9-under the card. “It feels unbelievable, it really does, all the hard work I’ve been putting in has come to fruition,” said Stowe, who will finish the final year of his PGA Traineeship as a winner of the world’s richest Trainee tournament. Stowe began the final round with a four-shot buffer which admittedly played on the 24-year-old’s mind. After nervously teeing up on the 1st, he was quickly able to settle into stride around the Ballarat Golf Club course. Following the completion of his PGA Traineeship, Stowe is looking to ply his trade on the international scene with a tilt at the Asian Tour Qualifying School as well as his home Tour, the ISPS HANDA PGA Tour of Australasia. “I’m planning on heading over to Asian Tour Qualifying School and hopefully get through that then I’ll play ISPS HANDA PGA Tour of Australasia Qualifying School in December,” added Stowe. Along with his Futures title, Stowe also receives automatic exemption in to the Australian PGA Championship at RACV Royal Pines Resort. Finishing in second place was 2017 champion Frazer Droop who shot 1-over 73 to finish at 4-under the card, Cooper Eccleston finished third at 3-under the card.